In his First World War memoir, 4.5 Howitzer Gunner, William Roberts describes how he got off on the wrong foot when interviewed for a possible recommendation for a commission. After the first few questions he leaned forward confidentially, resting his hands on the table where sat the commanding officer. There was a terrific explosion of wrath, and a yell of 'Stand to attention man when you address an officer.' A prompt dismissal was the end of that. So Roberts, like Stanley Spencer, who treated the wounded, was to see modern warfare from a position in the ranks, and it shows in his work, his choice of subject. Isaac Rosenberg, a fellow student at the Slade, wrote his poems from the point of view of a private in the infantry: the men on the march, or at rest, looking for lice in their shirts, huddled on troop-ship decks. 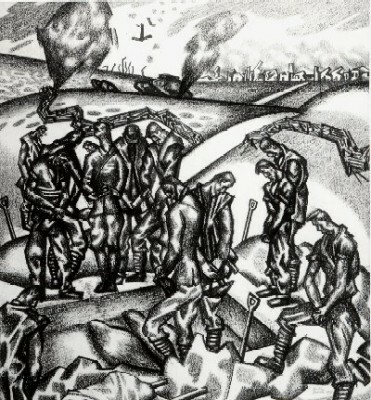 Roberts, in his turn, shows the ordinary soldier at work, drawing from his own experience: he's not looking at 'the men' from above; like Rosenberg, he's one of them. The Artillery  not his choice but that of the recruiting sergeant  was less exposed to danger than the infantry, but nonetheless suffered heavy casualties. In his memoir he describes, in a matter-of-fact style, not only death and destruction but also the hard day-to-day labour required: feeding and grooming the horses, loading the guns, putting up camouflage, burying the dead; in his paintings we see the daily grind of war. 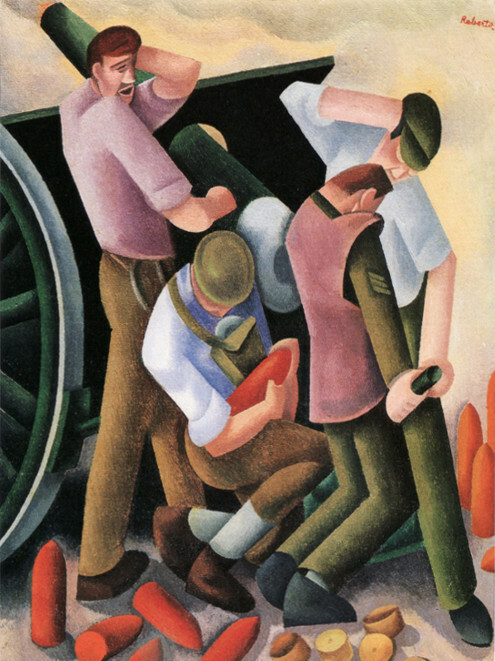 'There's someone who knows what it is to carry a heavy weight,' said a builder looking at a reproduction of Roberts's painting of men loading the guns, and certainly Roberts, in his return to figurative painting, albeit formalised, gives us the feel of the daily stress endured by the troops, their tensed bodies, the physical strain they underwent. 'We buried our own dead . . . ' he writes, 'shoulder to shoulder . . . in a wide shallow grave, each in his blood-stained uniform,' as he shows in his drawing of a burial party. 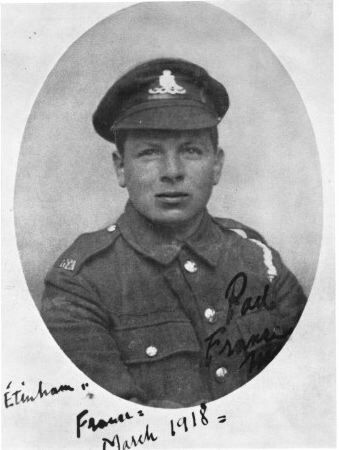 He had great admiration for the regular army officer who looked out for his men, describing Major Morrison searching by candlelight for survivors after a direct hit on a gun-pit; but, like his fellow privates, he had little respect for the officers on horseback with their gleaming boots, especially one whose boots and equipment had 'a mirror-like sparkle' and who 'seldom had to put his feet on the ground, preferring to be mounted, seated well above the mire'. Roberts could not get the same shine on the boots of the officer for whom he served as a batman for a while and who later, 'mounted on his horse', even ordered him to rescue two puppies he had left behind in a retreat under fire. So it was a novel experience, as he writes, on leave and dining at the Tour Eiffel restaurant, 'having for a year or more taken orders from sergeant-majors, sergeants, corporals, bombardiers . . . to find myself associating with majors, captains, lieutenants, actors and art critics'  the last group soon to be his bugbear! Official war artists usually held commissioned rank: Paul Nash, after seeing active service, found himself with a chauffeur and a batman to tour the battlefields; C. R. W. Nevinson and William Orpen also held commissions as war artists in the field. Correspondence in the Imperial War Museum suggests that a commission was requested for Roberts when he became a war artist for the Ministry of Information, but nothing seems to have come of this as his rank on demobilisation was noted as 'Gunner'.